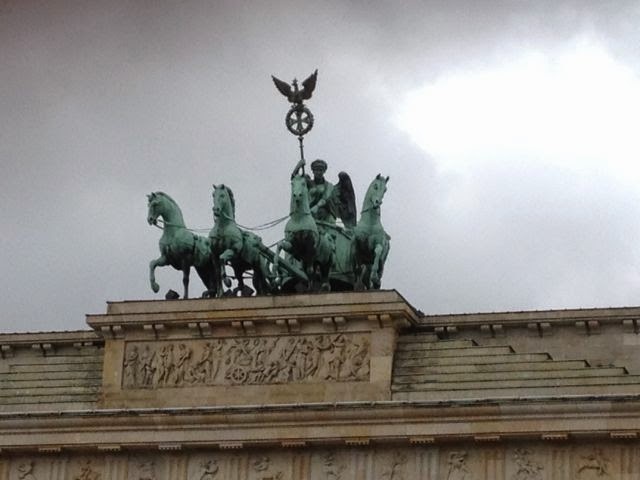 Can four years really have passed since I was in Berlin? Four years since that visit during the spargel (asparagus) season when there was no time to take a train to Dessau to see the Bauhaus Foundation. Ah, well next time. So, let's try again. A visit to the icon of modernism had to be top of the list. 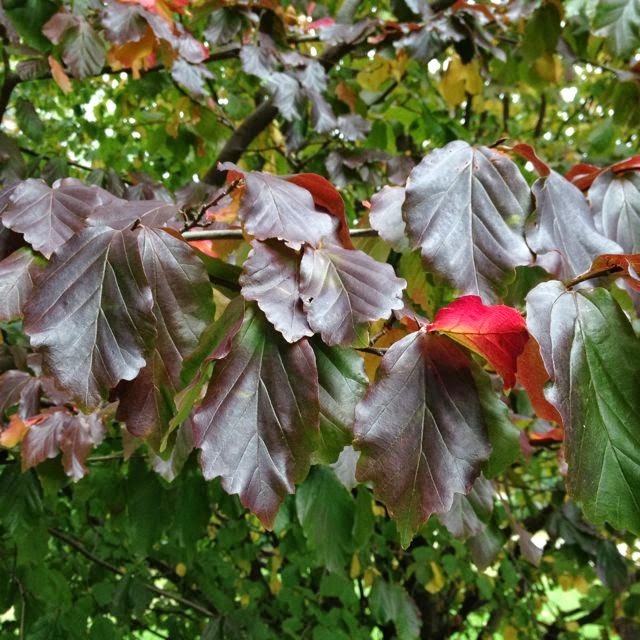 But first it was time to get our bearings and renew acquaintances. You'll notice there are very few photos of food in this piece. It just doesn't feel right in Berlin to be photographing your food, so let's eat. Maybe it'll start a trend! We left our bags at the hotel and headed south into Kreuzberg where the Turkish influence is strongest. There are many things to like about Turkish culture but, for me, Turkish Coffee is not one of them so we held out until we found the 'Coffee Roastery and Cake Shop' Five Elephant on Reichenbergerstr. A couple of cortados each and a slice of walnut and honey pie were life savers, but, but ... there was such a difference in the delivery of the the two coffee orders that I'd be remiss if I didn't mention a lack of consistency - perhaps just down to different baristas. The pie had a good filling but was spoilt by too much pastry. I'd say it's worth a try if you're in the area but I'd probably head for Companion Coffee 5 minutes away on nearby Oranienstr. OK, they don't roast their own coffee but they do brew up some fine guest ones including one of my favourites, a roast from Denmark's Coffee Collective. Sometimes it's Square Mile or Workshop from London. The Belleville (Paris) espresso, on when we visited, isn't one I'd seek out but there's no doubting the care and attention Companion Coffee pay to what they do. They also serve up a delicious banana cake and the set up, in Voo clothing shop in a quite yard off the main street, is a bit of a haven. I've saved the best for last. 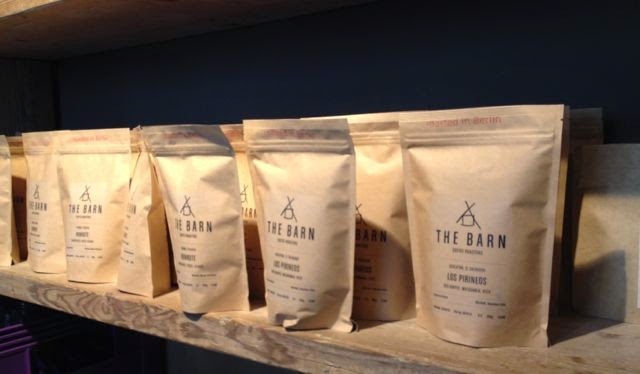 The Barn roast their own coffee and it's the place in Berlin that reminds me most of my favourite London roastery, Monmouth Coffee. I don't know The Barn well enough, yet, to be sure but there's a similar sense of sincerity that translates from what they say about themselves to how they deliver - keep close to the farmer and focus on quality and service. The Barn describes their roast style as "rather light" but it has never been too light-roast for me and I have an aversion to the new light roasts favoured by some roasteries. The Barn, we soon learned, was the only place to go when breakfast called - a cortado goes rather well with a pot of Bircher müsli. Sandwiches and cakes here are very good too. Expect consistent standards. It's tiny, so also expect to spill out onto the stools outside. There are a couple of useful places in Mitte district worth knowing about, particularly if you're looking for German/Austrian cuisine with its emphasis on meat. Aigner close to Gendarmenmarkt serves up very good Beef Consommé, Wiener Schnitzel and various game dishes with, maybe, plum dumplings to finish. The Kupferkessel (copper kettle) way with beef is particularly good. Everything is done very properly but without fuss. Rotisserie Weingrün is Aigner's sister restaurant where the, mostly meat, menu's success is down to careful sourcing and the flame grill. Both restaurants stock good wines, some from their own 'Horcher' vineyard. Restaurant Pauly Saal, again in Mitte, had been recommended to us more than once. Housed in a former Jewish girls' school, just down the road from The Barn, it's an easy place to miss. An understated frontage conceals a courtyard dining area, a gentleman's club like bar and murano chandelier bedecked dining room. No reservation and a pretty off-hand delivered "two hour wait" meant we went down the road to Cordobar instead. This German/Austrian collaboration proved much more welcoming, despite the place being rammed with locals and no tables available. OK, it's a bar but with really good wines, some natural and biodynamic served without making a big thing of it. As partner Willi said to us, what's most important to them is that they "serve good wines". We really enjoyed the natural wines we tried, all from Austria, all delicious, and none we had tried before. The fine glassware helped the flavours develop nicely. A regular changing menu of small sharing plates is titled "Cold Bites, 'Warm Bites' and 'Sweets'. I am, seriously, recommending you order the Bread & Butter - the best rye bread I've tasted comes with a bowl of whipped butter and it's a heavenly combination. A Fritz Blomeyer cheese plate was an eye-opener as to how good German cheeses can be (regrettably, I don't think these find their way beyond their homeland). I would have liked a little more generosity for 15 Euros but every portion was perfect and the fig chutney was beautifully spiced. You might find Oysters with almond emulsion & dill flower or Ribs with Jerusalem artichoke chips & a smoked vanilla dip on the menu, and maybe a chocolate cake with passionfruit cream. If we'd had a table instead of standing at the bar we'd certainly have ordered more food. Despite several visits to Berlin we'd never managed to penetrate Charlottenburg in Berlin's far West. So we walked along Unter den Linden, passed through the Brandenberg Gate and ambled through Berlin's green lung, the Tiergarten. My expectation of a more conspicuously wealthy Western Berlin was turned on its head. The former West looks much like the former East to my eye, the architecture being quite functional and there is generally a lack of conspicuous wealth. Rogacki deli has been around since 1928 and here on Charlottenburg's Wilmersdorfer Str. since 1932. It's very green - in colour rather than in credentials - and I have to agree with Foodie in Berlin that if it was in London it would have had "half a dozen facelifts" by now and probably be the worse for it. Needless to say it's a German institution. Although I'd give some of the food counters a miss - bakery and cheese are particularly underwhelming - the meat, poultry, game and fish sections are musts. 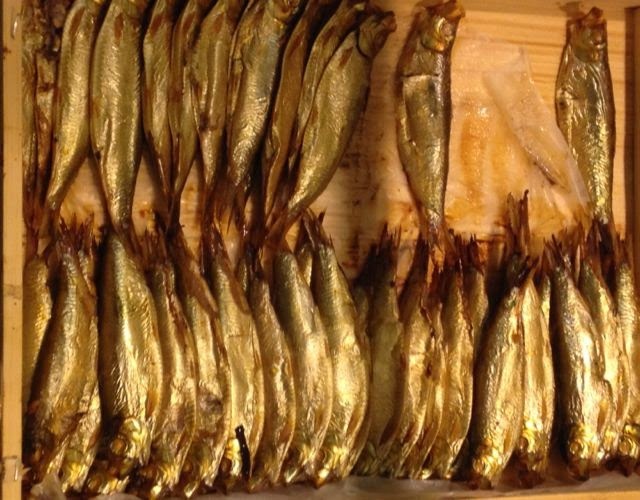 In their raw state they're impressive enough but the variety of smoked fish in particular is outstanding. We paused for lunch at one of the standing bars where I confidently decided 'Krabbentoast' had to be Crab on Toast - it turned out to be prawn salad!. Fortunately the staff are hugely tolerant of non-German speakers and, with the help of local diners, we were offered either North Sea (peeled prawns) or German Sea (brown shrimp) . The firm favourite that day was clearly the Fish Soup so that's what I had. A huge bowl of good mixed white fish in a clear broth topped with chopped dill, the brown shrimp salad, bread and two glasses of Reisling and the meagre bill was under 20 Euros. Charlottenburg is also home to a Manufactum store. 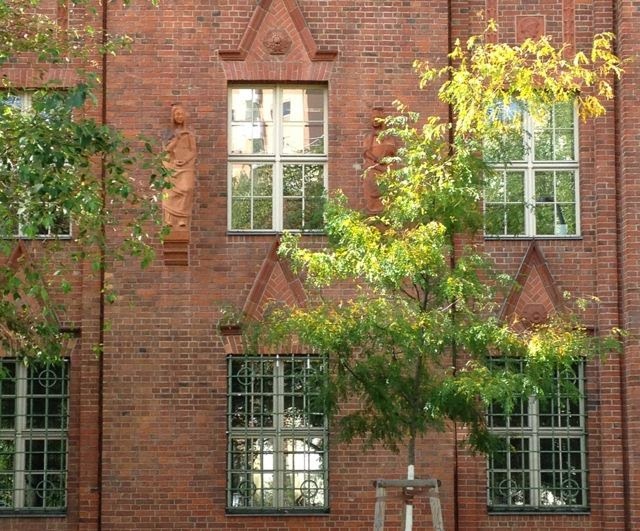 With two floors of traditionally made household and gardening products, food and clothing, its presence just off Ernst Reuter Platz was like a honeypot to a bee. Expect to see everything from a boot scraper to a dinner gong. All is top quality and not necessarily German. The prices reflect the quality, but it makes compelling browsing. 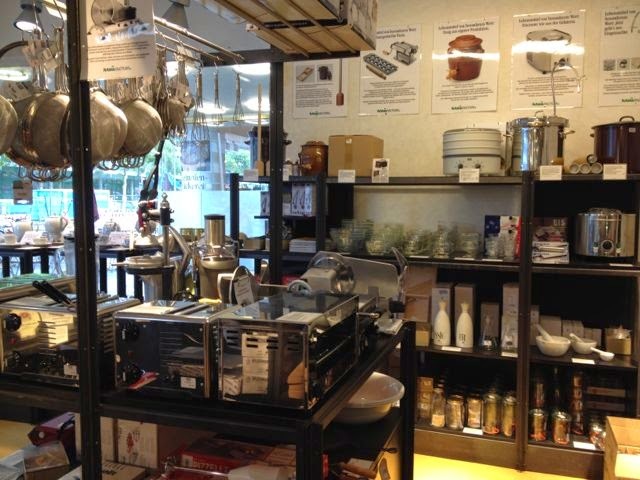 There's also a good-looking bakery/cafe next door called Brod & Butter which I wish we'd had chance to try. Bauhaus Dessau was calling and this time I would make it. 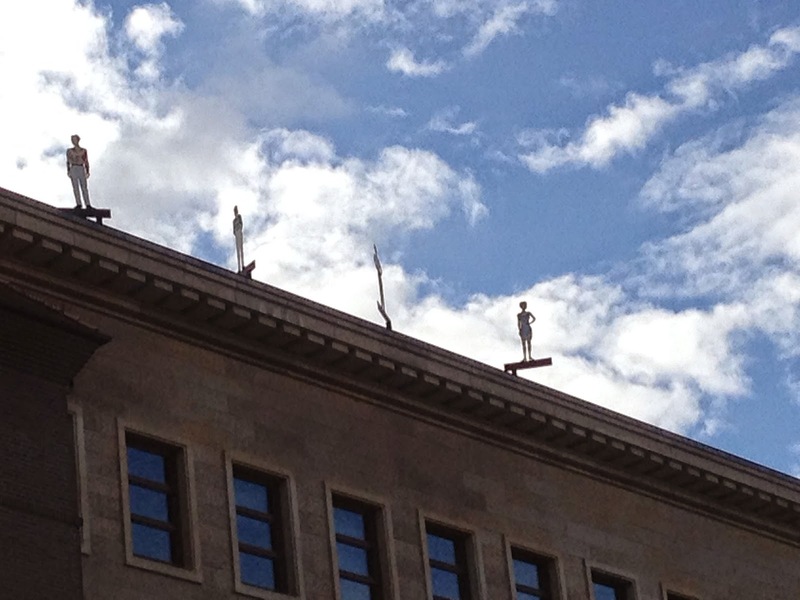 The train from Hauptbahnhof in Mitte takes less than 2hrs. Once clear of Charlottenburg and Wilmersdorf it cuts through the 827km Naturpark Hoher Fläming so the ride is far from tedious. I'd waited so long to see the Bauhaus building and suddenly, 5 minutes after stepping off the train, it was right in front of me. A collective that lasted only 14 years, 7 of the most productive in Dessau between 1925-1932, the Bauhaus movement continues to influence art, architecture and design. Recently restored, the building is once again brought to life with students attending classes in the Bauhaus Lab, College, Summer Schools and Workshops. 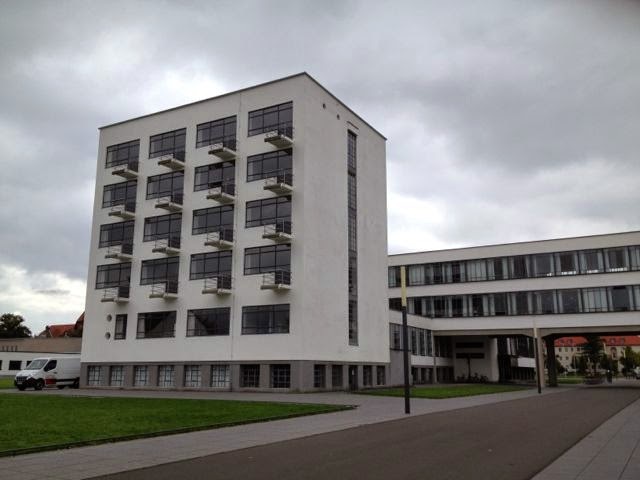 It's also now occupied by the Bauhaus Dessau Foundation. 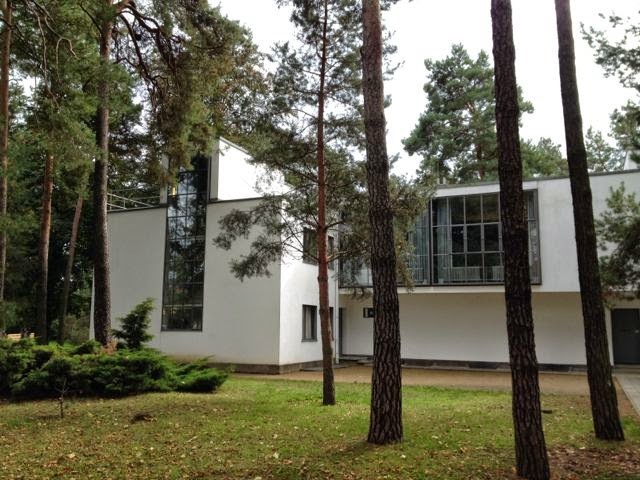 The Bauhaus building and the nearby Masters' Houses, designed, furnished and worked in by their occupants - including Walter Gropius, Laszlo Moholgy Nagy, Lyonel Feininger, Oskar Schlemmer, Paul Klee, Wassily Kandinsky and Ludwig Mies van der Rohe - are open to the public every day. You can even eat in the newly re-opened Bauhaus Canteen (though I have to say there is still room for improvement on the food front), and stay overnight in the Studio Building. Well worth a 2-hour journey. I made it! Back in Berlin, Museum Island will keep you occupied for days. A central area of the City where the greatest of Berlin's treasures are gathered - the architecture is a big draw in its own right. My pick would be the Neues Museum, recently restored by the British architect David Chipperfield, where the surviving war damaged parts of the building have been beautifully integrated into the new. Amongst its great works is the famous, and stunningly beautiful, bust of Egyptian Queen Nefertiti presiding over a room of her own. Frustratingly, although we joined the queue for the Pergammonmuseum, we simply ran out of time to visit so this is top of my list for next time. The closed-in architecture of the Jewish Museum Berlin adds to the experience making this the most affecting museum I've ever visited. 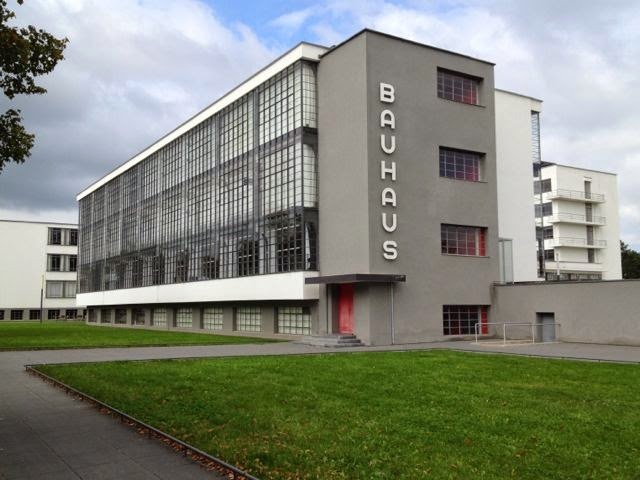 If you can't catch the train to Dessau, you can get a Bauhaus fix at the Bauhaus Archive right in the centre of Berlin.